Clouds are classified not only by types, species and varieties. Rather, they are also classified according to peculiarity or supplementary features attached onto the body of the parent cloud. One example is praecipitatio clouds. Here are some interesting facts about this cloud supplementary feature. Praecipitatio clouds refer to cloud forms whose precipitation reaches the Earth’s surface. The name is derived from the Latin word praecipitatio which means “fall” that rightly describes cloud formations that produce precipitation that falls to the ground. Precipitation may come in the form of drizzle, ice pellets, rain, snow and hail. Due to the presence of a large amount of moisture stored in the atmosphere, it falls back to the ground in the form of precipitation. Depending on the cloud’s altitude, precipitation may range from light drizzle to heavy rainfall. This is often called the stratus rain cloud because it brings about precipitation in the form of ice prisms, snow grains or light drizzles. Praecipitatio clouds appearing in dense nimbostratus clouds look like a dark blanket covering the sky. It should not be confused with its altostratus and stratus counterparts because nimbostratus praecipitatio appears as darker gray and responsible for bringing more severe rainfall. When precipitation falls from large, cottony and puffy cumulus clouds, it is called cumulus praecipitatio. If the low and irregularly-shaped stratocumulus cloud produces rain, it is in the form of stratocumulus praecipitatio. Rising currents of air in the atmosphere allow the formation of stratocumulus praecipitatio. This is a form of praecipitatio cloud that shows gray-toned altostratus cloud covering hundreds of miles across the sky. It is a result of weak rain systems in the middle cloud level. 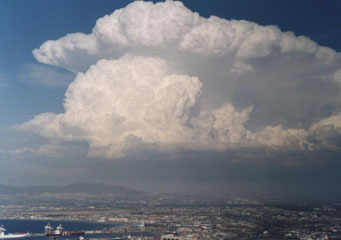 Praecipitatio appearing in thunderstorm cumulonimbus cloud brings about heavy precipitation either in the form of rain, snow, ice pellets or hail. At What Height is Praecipitatio Clouds Found? Praecipitatio supplementary cloud feature is found in the low and middle level clouds. So, if it appears with low level clouds such as stratus, stratocumulus, nimbostratus, cumulus and cumulonimbus, it can be found at elevations about 6,000 feet or under from the Earth’s surface. On the other hand, if it appears at the middle cloud level like the altostratus, then it can be found at elevations anywhere between 6,000 feet and 20,000 feet from the ground. Praecipitatio cloud can be made up of water droplets and ice crystals. How do Praecipitatio Clouds Form? Praecipitatio clouds form due to large amounts of moisture in the atmosphere. It occurs when warm air is lifted up to the region of cold air. The lifting of warm air could be due to surface heating from the sun, advancing low pressure system or when the air is pushed uphill. Since warm air is less dense than cold air, it will continue to rise and eventually cools and condenses into clouds. When a lot of moisture has been stored up there, it becomes too heavy to stay aloft and therefore fall back onto the Earth. What do Praecipitatio Clouds Look Like? These clouds usually have light to dark gray color indicating the amount of moisture present in them. They may also appear puffy or spread out like blanket across the sky thereby rendering an overcast ambience. How common are Praecipitatio Clouds? Praecipitatio is common anywhere in the world as precipitation is vital to keep living and non-living things on Earth hydrated. Praecipitatio clouds are responsible for precipitation that reaches the Earth’s surface. The amount of precipitation they bring may range from light drizzle to intense rainfall or hail depending on the parent cloud in which they appear and the weather system responsible for their formation.